(Nanowerk News) Thanks to the work of an interdisciplinary team of researchers at the Dartmouth Center of Nanotechnology Excellence, funded by the National Institutes of Health, the next-generation magnetic nanoparticles (MNPs) may soon be treating deep-seated and difficult-to-reach tumors within the human body. Though the researchers caution that any new therapies based on their discoveries will have to prove safe and effective in clinical trials before becoming routinely available for people with cancer, they point to the work they published this week in the Journal of Applied Physics ("Magnetic nanoparticles with high specific absorption rate of electromagnetic energy at low field strength for hyperthermia therapy") as significant progress. Transmission electron microscopy images of Dartmouth’s flower-like magnetic nanoparticles. They created a new class of flower-shaped magnetic nanoparticles with superior performance in low-level magnetic fields and worked out their heating mechanism. The work provides future suggestions for developing a new generation of irregularly shaped magnetic nanoparticles for hyperthermia cancer therapy. What is clinical hyperthermia? It’s a technique in which the temperature of a part or the whole of the body is raised above normal. Heat is known to damage or destroy cancerous cells, but to harness it safely and effectively, heating must be applied very specifically and the tumor must be kept within an exacting temperature range for a precise period of time. When the human body is placed in a high frequency and strong alternating field, it begins to warm up and, if left unchecked, this could damage normal cells. “One way to avoid damaging normal tissue is by gaining a deeper understanding of the magnetic nanoparticles’ heating mechanisms and using this knowledge to create magnetic nanoparticles that heat at low field strengths,” Shubitidze pointed out. Overall, magnetic nanoparticle hyperthermia consists of two main steps: delivery and then activation of nanoparticles inside tumor cells. Once the magnetic nanoparticles are delivered inside tumor cells, the system activates an electromagnetic field that transfers energy to them, creating localized heating to destroy the tumor cells. The particles designed, synthesized and tested by the team show improved performance at low field levels compared to their commercially available counterparts. In terms of applications, magnetic nanoparticle hyperthermia proves effective when there are enough particles in the tumor, when the particles have favorable heating properties, and when a sufficiently strong magnetic field is delivered. The technology can be used as a standalone therapy or as an adjuvant therapy along with chemo and radiation therapies for cancer treatment. 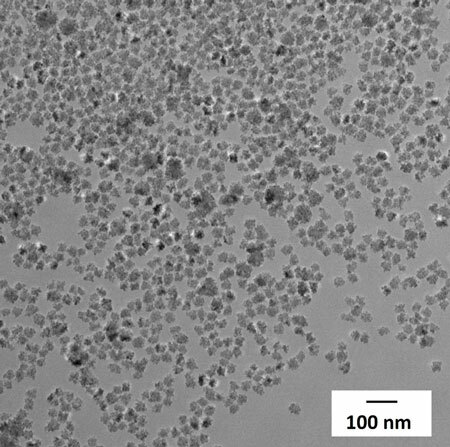 The development of magnetic nanoparticles that heat at lower field levels is an “important step toward making magnetic nanoparticle hyperthermia a clinically viable treatment for deep-seated cancers,” Shubitidze noted. What’s next for the team? “We’re currently working to combine our magnetic nanoparticles and a new device to deliver a higher field strength to the tumor in the case of pancreatic cancer, which is a particularly difficult target for conventional field generating devices,” said Shubitidze.